Preheat your oven to 400 degrees. Cover a cookie sheet in aluminum foil. Cover the cut sides of the butternut squash in a splash of olive oil, a pinch of salt, a pinch of pepper, a pinch thyme, and a pinch sage. Place cut sides down on the cookie sheet. Roast squash in the oven for 30 minutes. Set aside. Put ½ Tbs olive oil in a large pot over medium heat; cook the diced shallots, garlic, until transparent and fragrant, about 5 minutes. Add the chicken to the pot and cover it with 1/4 tsp salt, ¼ tsp ground black pepper, ¼ tsp rubbed sage, ¼ tsp thyme, and a pinch of red pepper flakes. Cook the chicken until cooked all the way through (4-6 mins per side depending on how thick your chicken breast is). Remove the chicken from the pan, leaving the garlic and onions in the pan. Turn the heat off. Cut the butternut squash into cubes, and remove the outer skin. Add the squash to the pan and mix, set the heat to medium. Then add 4 cups of chicken stock and ½ cup coconut cream to the pot; bring to a simmer and cook 10 to 15 minutes. 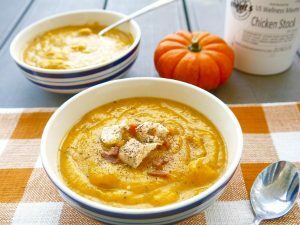 Season the soup with 1/8 tsp cumin, 1/4 tsp nutmeg, 1tsp salt, and ¼ tsp ground pepper, ¼ tsp thyme, ½ tsp sage and 1 Tbs honey; remove from heat. Puree the soup using a stick blender or a blender. Add the diced chicken to the soup or to each individual bowl of soup. To add bacon, put strips of bacon on a plate lined with paper towels and cover the top of them with paper towels and cooked them for 2-3 minutes. Then replace the paper towels and put them back in the microwave for 3 minutes. If the bacon is crispy, then crumble up the bacon and add to the soup.